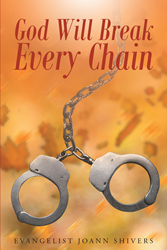 “God Will Break Every Chain” from Christian Faith Publishing author Evangelist Joann Shivers is the author’s story. This is the story of a woman enslaved by a hopeless lifestyle who found her way. “God Will Break Every Chain”: an inspirational story for those shackled by the chains of a broken life. “God Will Break Every Chain” is the creation of published author, Evangelist Joann Shivers, a writer and a woman of great faith and wisdom. She is a great motivational speaker. God’s hand was on her life at an early age. She was born and raised in Vero Beach, Florida and has dedicated her life and ministry to letting others know that they too can be healed, delivered, and set free. Published by Christian Faith Publishing, Evangelist Joann Shivers’ new book tells an inspiring story of freedom. Delivered from many years of addiction to crack cocaine and prostitution, author Evangelist Joann Shivers has a compelling story to tell. God prompted this powerful author and speaker to share her story with the world. Through her willingness to share, she has had a profound impact on the lives of many around the world. Evangelist Joann Shivers wants readers to know God’s plan for their lives does not include enslavement to others. For those shackled by the chains of a broken life, this is a story that just might inspire them to seek freedom. View a synopsis of “God Will Break Every Chain” on YouTube. Consumers can purchase “God Will Break Every Chain” at traditional brick & mortar bookstores, or online at Amazon.com, Apple iTunes store, Kobo or Barnes and Noble. For additional information or inquiries about “God Will Break Every Chain”, contact the Christian Faith Publishing media department at 866-554-0919.